Spring is just around the corner, and adding a bit of floral flair to interior decor is a great way to celebrate the season. Those who are inspired to incorporate a creative touch into the home will enjoy crafting a personalized flower out of nothing more than a couple of coffee filters. The same material that makes these filters light to handle yet durable with liquids proves wonderful when it comes to transforming the filter into a charming floral accent piece. 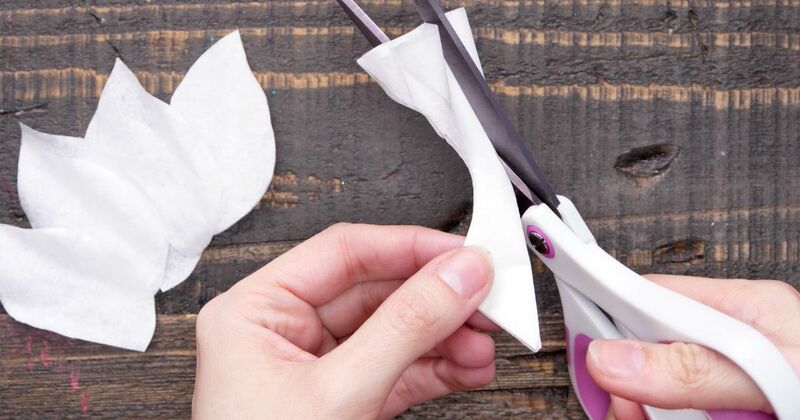 It doesn’t take much more than a hot glue gun and scissors to craft this charming flower. With options to mix and match food coloring hues for the final color, a coffee filter flower is a fun project for both kids and adults. The finished flower looks beautiful when placed in a vase on a table or shelf. Add a little texture by backing the filter flower with a stem of faux leaves for a more robust springtime appearance. 1. Fold a coffee filter in half horizontally so the wavy edges meet. Press the fold flat then fold in half twice more. 2. Cut a petal shape from the coffee filter beginning halfway up from the pointed end. Once cut and re-opened, the paper will separate into six separate petals. 3. Cut a narrow petal shape from the remaining folded coffee filter beginning at the half-way point and rounding left towards the flat edge. When opened, eight points should be visible and still attached in the center like a snowflake. 4. Pinch the center point of the eight-petal piece together and twist so that the points come close together at the top edges. This will be the center of the flower bloom. 5. Apply a line of hot glue down one side of the bloom center, and press the left edge of one of the separate, larger loose petals to attach. Continue attaching the six larger petals side by side until they surround the entire center. 6. Pinch the bottom of the bloom to secure all petals together, and fluff the tops of the larger petals away from the center point to create the desired look and texture. 7. Fold a second coffee filter in thirds exactly like the first filter. 8. Cut a large raindrop shape from the folded filter, beginning at the straight edge and cutting towards the pointed end. Once opened, this will create six petals that are slightly larger than the previously attached petals. 9. Apply a line of hot glue to the outside of the attached petals, and begin securing each of the six larger petals around the bloom allowing for some overlap. Continue attaching large petals until four layers of paper petals are attached. This requires five coffee filters. 10. Once the outer petals are all attached, fluff the tops out to create a texturized look. 11. Fold one end of a 12-inch piece of crafting wire into a loop. 12. Apply a spot of hot glue to the center point of the back of the flower bloom, and press the wire loop to the glue to attach as the steam. 13. Fill a small plastic bowl with water and add five drops of red food coloring. 14. Stir the food coloring with a tongue depressor until the water is completely red. 15. Gently dip the ends of the coffee filter flower petals into the water, holding onto the stem to keep the bloom from completely submerging. Allow the red water to absorb more fully into the center of the bloom and slightly less near the petal edges. 16. Place the flower in a vase on a shelf or table, and back it with faux leaf stems for a fuller appearance and beautiful color contrast.